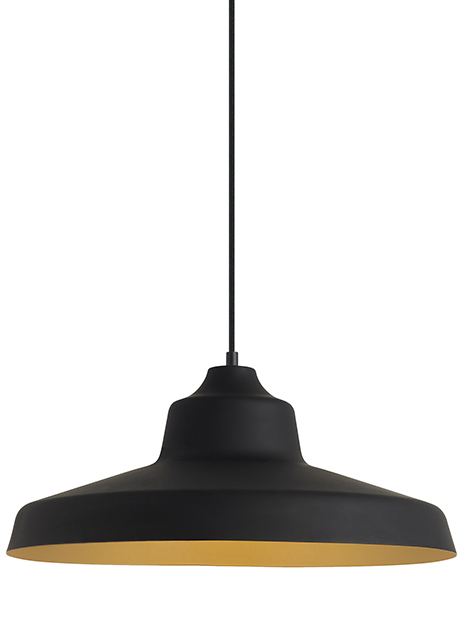 The Zevo pendant light from Tech Lighting is an oversized 18"diameter version of a popular industrial-inspired design and creates a bold statement no matter which of the diverse finish options is selected. Fixtures with this ubiquitous silhouette were used for decades as light in warehouses, factories, barns and are now found as light in hip restaurants and eclectic homes. Available in a Fossil Gray finish with a Black cloth cord. a Matte White finish with a White cloth cord. or a Black Exterior finish coupled with a Gold Interior finish with a Black cloth cord. all with matching canopy. Damp-rated and dimmable. Available with or without lamp. No lamp rated for E26 medium base socket 75w max. LED version includes (1) 10 watt 737 delivered lumens ,90CRI, 3000K LED A19. Dimmable with a low-voltage electronic dimmer. Includes 8' of field-cuttable cable.